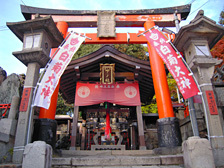 The deity Shiragiku Okami is worshiped here. An ancient mirror called Henkei Shinjukyo was discovered in the late 1880s or early 1890s, presumably during repair work. It is now exhibited at the Kyoto National Museum.